I figure Wednesday is as good of a day as any to talk about food. On a warm September day, I came home to find a coupon for a free Chipolte burrito in my mailbox . The coupon basically said "Hey Steve, come to Chipolte and get fat on us." And I'm not turning that offer down. Despite your past affiliation with the land of Big Macs, your burritos are delicious and addictive. I would not be surprised to find out that you wrap nicotine in those tortillas. And now as I sit here with a stomach full of black beans, rice, and mysterious Mexican sauces, I feel all the more unhealthy, tired, and generally unmotivated to do anything for the rest of the day. 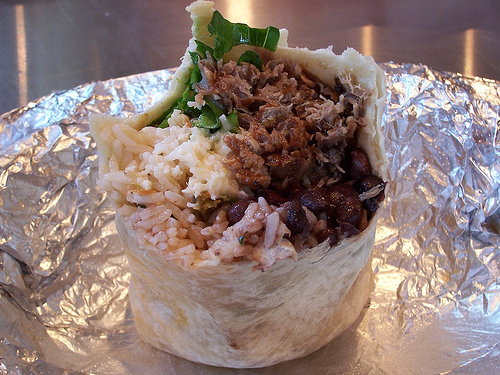 Your burrito wins. So anyways, on the topic of baseball (which I think is the theme of this blog), the Yanks and Jays brawled last night. The Blue Jays decided to ignite a fight because beating up guys in pajamas is way more fun than playing mediocre baseball, and I couldn't agree more. Though I don't know if I start a fight with the Yankees for the simple fact that C.C. could mistake you for a couch and decide to sit on you at any time. Back in Boston though, Frasier takes the hill. One question, you got "a coupon for a free Chipolte burrito in your mailbox". Gross!! Why would anyone want a chipolte burrito in their mailbox?? ?